Unravel the tRNA pool alteration in diseases. 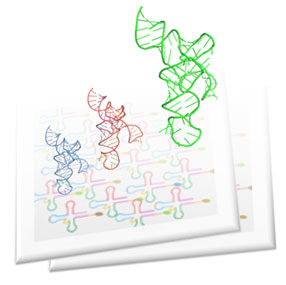 Transfer RNAs (tRNAs) are ubiquitous and the most abundant of all small non-coding RNA molecules. As a fundamental component in translation, tRNAs serve as the physical link between the mRNA and the protein sequences. To conveniently, reliably and accurately profile the tRNA repertoire, Arraystar has developed the first commercially available nrStar™ Human tRNA Repertoire PCR Array in the market. The PCR Array profiles 66 PCR-distinguishable nuclear tRNAs and all human mitochondrial tRNAs, covering all anti-codons provided by GtRNAdb and tRNAdb databases. Specially optimized tRNA demethylation is used to overcome heavy tRNA modifications to gain upmost profiling efficiency.